This title was first published in 2001. The global legal landscape is littered with attempts to provide context and meaning for sexual harassment law. Most have failed because they have limited themselves to the mere words of law. 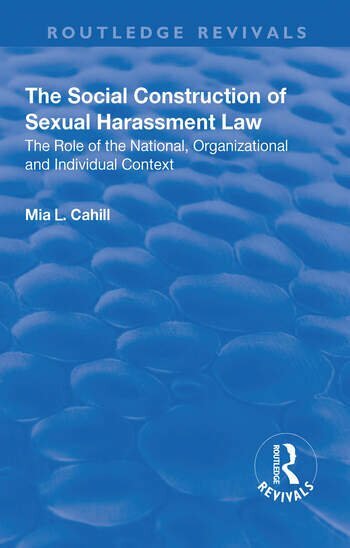 This cross-national study is the first to expand our notion of sexual harassment law and implementation by exposing the relationship between law and its social context, demonstrating how this fundamentally influences legal understandings and outcomes. Taking a unique theoretical approach, this book explores perceptions of law within national, corporate and the individual contexts, analyzing the potentials of each level to influence the social understanding of law and the wider role of law in society itself. The result is a pioneering work of fresh insight which will appeal to a broad range of academic disciplines. Contents: Introduction; The social context of sexual harassment: the national level; Sexual harassment law in the USA and Austria; The social context of sexual harassment: managerial interpretations of the law; The national, organizational and individual levels of social context; Employee perceptions of illegal sexual harassment and employee support for punitive organizational action; Conclusions; Appendices; Bibliography; Index. Mia Cahill Institute for Law and Society, New York University, USA, a visiting scholar at the New York University and works in the survey division of Mathematica Policy Research, Inc. a think tank in Princeton, New Jersey, USA.